Pleated drapes can be difficult to make. 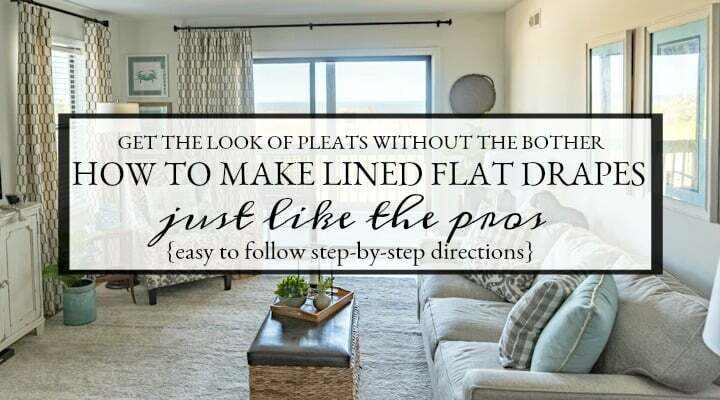 Get the look of pleats without the difficulty by using basic flat drapery panels instead. 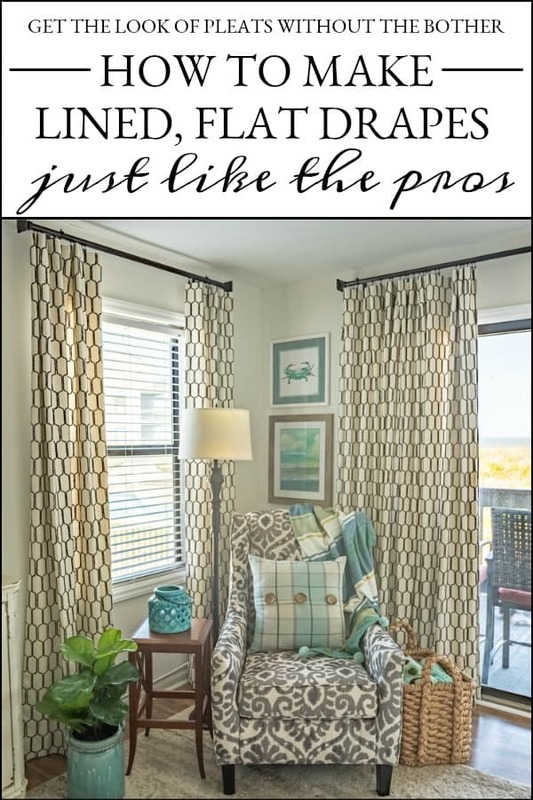 Here you’ll find easy to follow, step-by-step directions for how to make lined, flat drapes in your own home using the same methods that professionals do. Save money by doing it yourself! My friends, if you can sew a straight line, you can do this! Let me give you just a little bit of background before we begin though. 😀 In case you don’t already know, I used to own and operate a custom window treatment business. My workroom was located in the basement of our former home. Even though I no longer have a window treatment business, I still kept the custom table that the hubs built for me and all of my industrial machines when we moved into our current home and use it in the bonus room above our garage. Why am I telling you all this? Well….there are two reasons. Reason #1: I wanted you to know that because I have experience in this area, the directions that I’m giving you are valid. 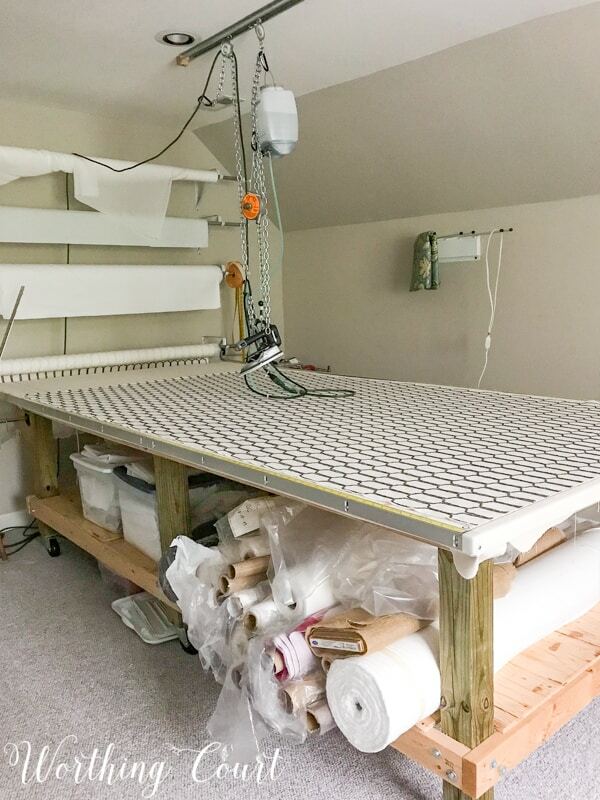 Reason #2: because of the fact that I had a professional window treatment workroom, you’ll see that I have a huge (5′ x 10′) worktable and a hanging/sliding iron above it. All of these photos were taken in my workroom/sewing room, but I want you to know that you TOTALLY don’t need those things to make professional quality drapes! Drapery fabric is wider than most clothing or craft fabric, so I recommend using the floor (which I’ve done many times), two folding tables pushed together or two sheets of plywood on sawhorses pushed together (be sure to cover the plywood with a vinyl table cloth or protective fabric to prevent snags) to spread your fabric on. And a regular household iron will be fine too – you’d don’t need one geared toward workrooms. I’ve shared all of my favorite sewing tools and gadgets down below! 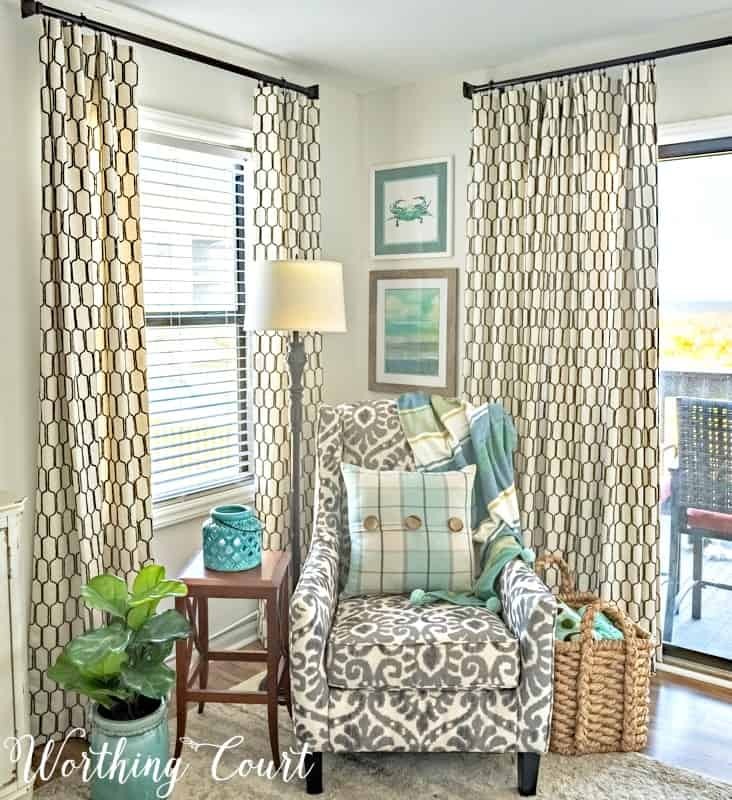 When flat panel drapes are opened up, not only do they mimic the look of pleated draperies, they’re much easier to make and they don’t require as much fabric. For example, home decor fabric is usually around 54″ wide or so, but by the time you add pleats, one width of fabric can be reduced by half or more, depending upon the size, type and spacing of your pleats. I’m going to take you through the entire process of making lined, flat drapery panels, step-by-step. It isn’t hard, but to avoid having an overly long blog post, I’ve divided it into two parts. You can read Part II right HERE. Let’s get started! These calculations are to make ONE drapery panel that is one width of fabric wide. 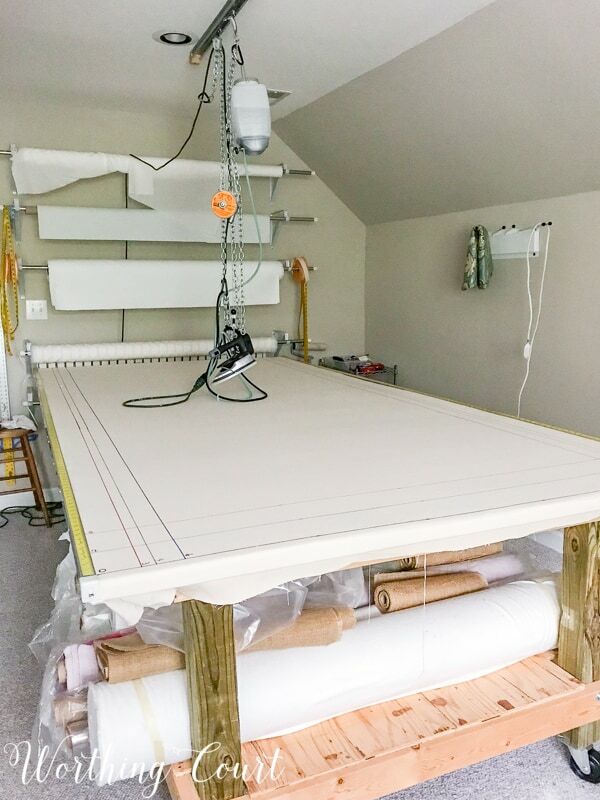 I knew that I wanted my panels to hang a few inches above the window trim, which meant that I wanted the FINISHED length of each panel to be 97″. 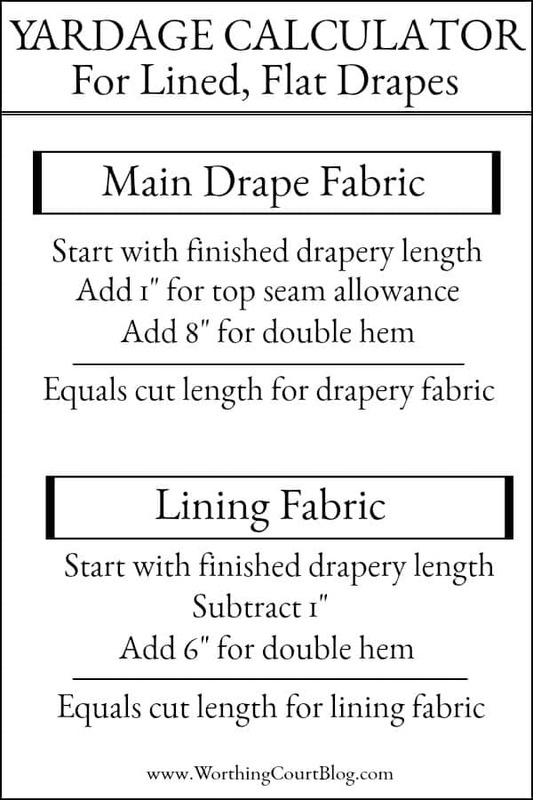 You may want a different length of drapery panel than mine, but you can still use this same formula to calculate how long each cut of drapery and lining fabric should be. 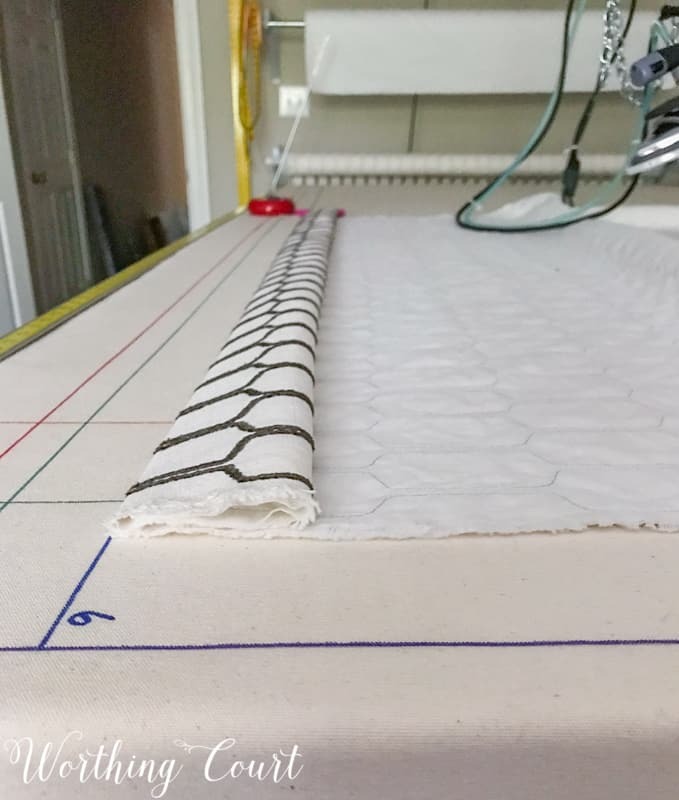 TIP: When calculating the finished length of your panels, don’t forget to take into account the height of the drapery rod and how far down the drapery rings will allow them to hang! Unroll (or unfold) the fabric and spread it out smoothly. 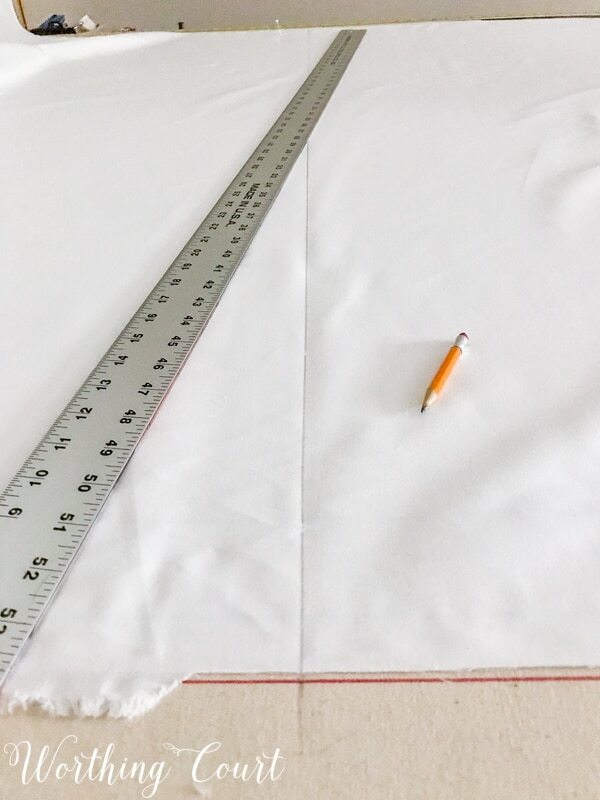 To get an accurate measurement, be sure that the fabric is square to the cutting surface and that there are no wrinkles in the fabric. At this point, it doesn’t matter if the fabric is spread right side up or down. Check to see if your fabric has a selvage on either side and remove if necessary – see STEP 4. Mark the desired length and cut. TIP: I’ve found it handy to use a yardstick to help smooth the fabric from one side to the other. Turn the fabric right side down and fold, press and pin the hem for the drapery panel in place, at what will be the bottom end of the cut panel. 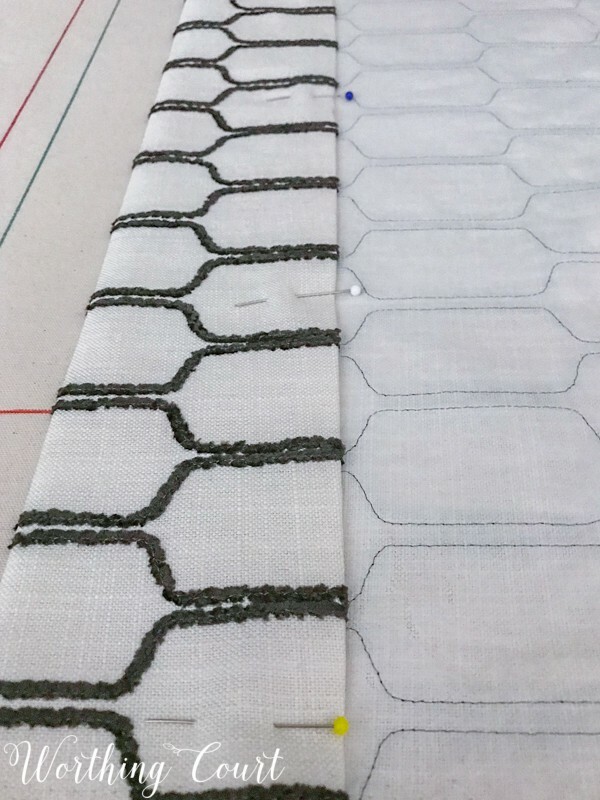 Pay attention to which way the pattern is running on your fabric to determine what the bottom of the panel is! 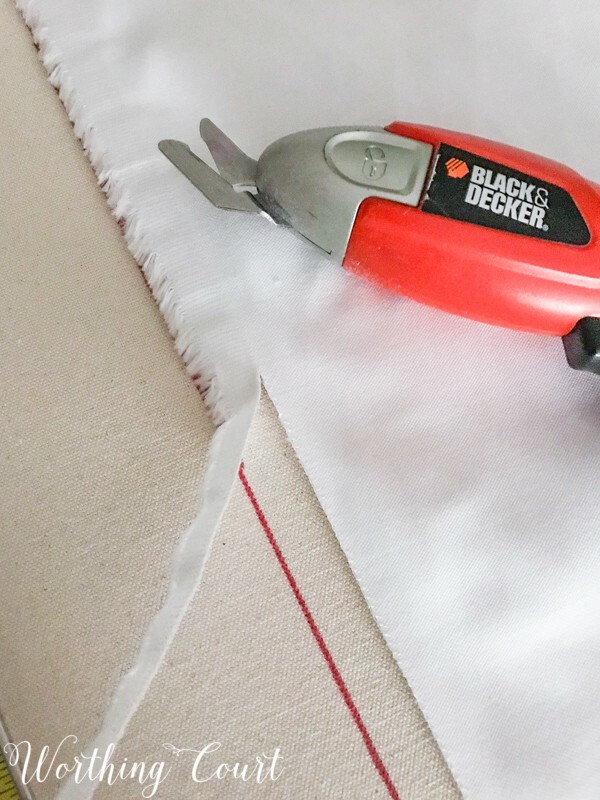 Professionally made draperies have a 4″ double hem, so fold your fabric up 8″ and then fold half of that under, then press and pin into place. TIP: For professional results, do not sew the hem in place using a regular straight stitch. You don’t want the stitches to be visible from the right side of the panel. I recommend hand sewing, using ONE OF THESE METHODS or use a blind stitch foot or attachment for your sewing machine. I nearly always use a slip stitch when hemming by hand. Place the hemmed panel aside. All lining fabric that I’ve ever used has a selvage on each side of the fabric. 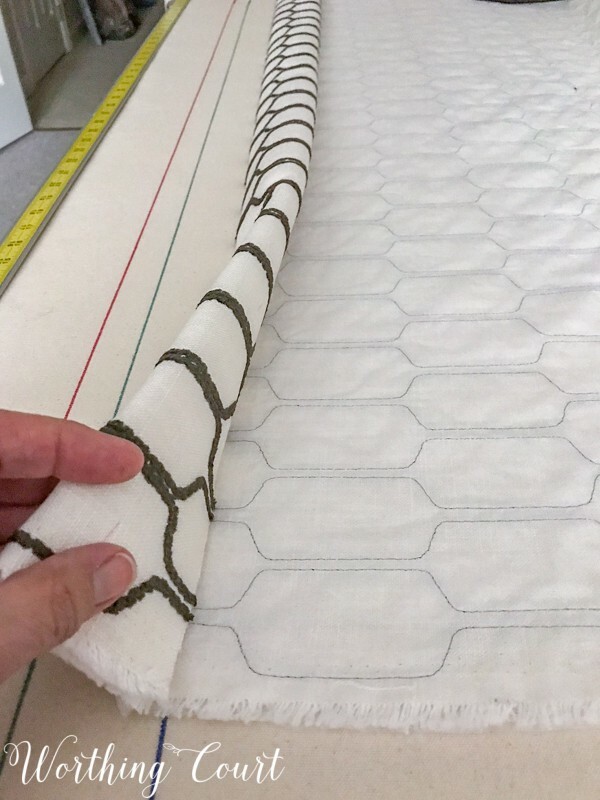 The selvage is woven more tightly than the rest of the fabric and should be cut off prior to getting the final measurement for cutting the lining panel. After removing the selvage, don’t forget to square the fabric and smooth all of the wrinkles out before measuring and cutting. 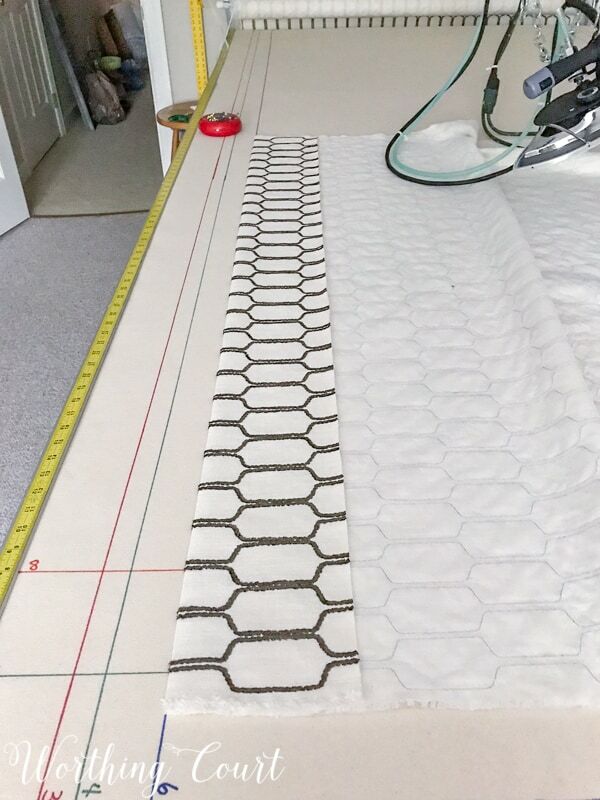 The finished length of the lining panel should be 1″ – 2″ shorter than the finished length of the drapery panel, which is reflected in the above yardage calculator. 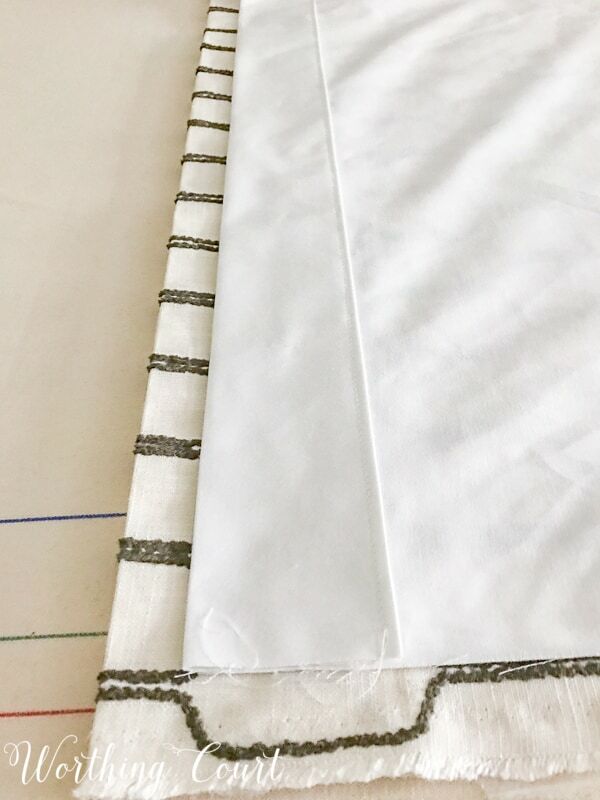 Follow step 3 for cutting and hemming the lining panel, with the exception being to use a double 3″ wide hem – fold the fabric up 6″ (instead of 8″) and then fold in half. Sew the hem into place using the regular straight stitch on your sewing machine. 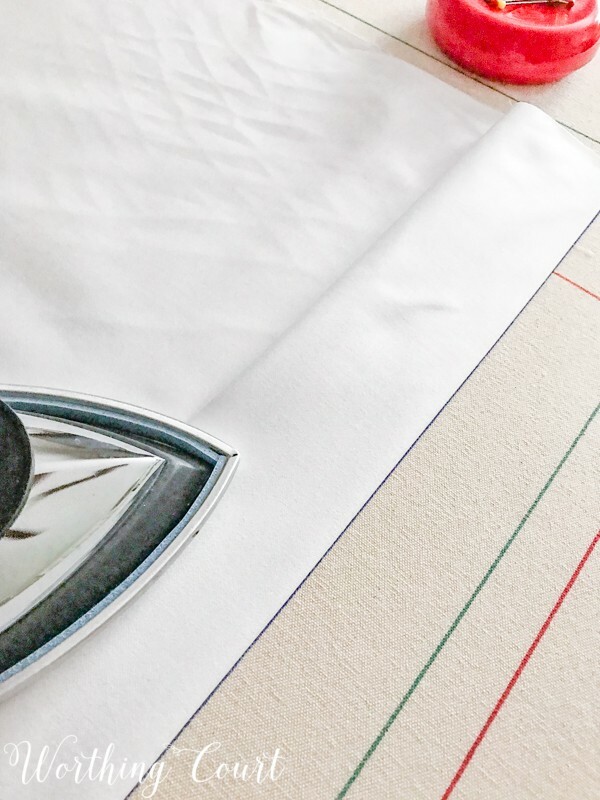 TIP: I prefer to use white, cotton sateen drapery lining fabric that weighs about 4.5 oz. The right side of the lining fabric is the one that’s shinier than the other side. If you’ve measured correctly, your lining hem should wind up being about 1″ shorter than the drapery panel. Now that we have the drapery and lining panels cut and hemmed, this is a good stopping point for today. Get the rest of the directions by clicking HERE for Part II. Looks easy enough. Thanks for the tip! This is a great tutorial – I love your decorating ideas! Please do more tutorials on window treatments! Does this same method work if the lining is a blackout fabric or are extra steps required? Hi Michelle. The method should be the same. Just know though, that tiny holes will be created any place that a needle penetrates the fabric. That usually isn’t a problem (in terms of being able to see light coming through from the front side) on draperies, but it’s something you should be aware of. Is it always necessary to line draperies? I have a linen fabric and the drapes will be stationary on either side of the window. We won’t be closing them.